A few weeks ago, I came across the story of Vegas and his son Sam. 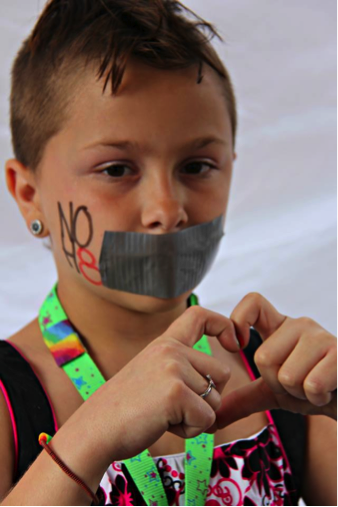 Sam, out of his own free (mature) will, wanted to take a photo for the NOH8 campaign, so he put on a dress, taped his mouth, painted the iconic NOH8 sign on his cheek and had his parents take the photo. Vegas updated his profile with this picture of his step-son, proudly showing off his son. Some people took offense to this photo, claiming that it was cruel to put a boy child in a dress, or even tape his mouth. As it happened, child protective services were called on the Vegas and his family. How would you react if someone told you how to bring up your child, specially when your child has a better sense of equality than a good population of the world? Below is what Vegas had to say about the situation. Q. Can you tell us a little bit about yourself, your family and work you do in addition to being a tattoo artist? I am a transgender female to male. I’ve been in transition for 1 year lived as a male my whole 26 years of life. Sam is my 10 year old step son and Heidi is my soon to be wife. I believe in teaching Sam the qualities I never was taught. We raise him with love and acceptance. I run a group called trans. Proud of Binghamton NY. With Trans. Proud we educate counsel advocate for support and much more for the people in the Trans. Community. Q. The above photo of Sam led to some controversy. Tell us whose decision the photo and the dress was. Sam is a child advocate who teaches children what it feels like to have a transgender father. He knows all the issues regarding transgenders and what it means to accept and love no matter who or what we are. Sam was given money and he decided with his money to buy his own dress. He said it’s Pride month and he’s in support of transgenders. Q. Have you been able to pinpoint who complained to child services? Q. I’m sure Sam too was questioned by child protective services. What was his reaction to the whole situation? He acted like it was another normal hassle. Q. I personally find it ridiculous that people are judging how you have brought up your child. What do you have to say to these people? I’m sorry they disagree with me but it’ll be there children who are going to have no jobs and live off public assistance their whole life. Sam is turning out to be a well-rounded little boy. He’s 10 makes his own bed, cleans his own room without prompting has good grades and doesn’t get disrespectful or misbehave like the children of the people who complained. Q. You clearly have instilled some great values in your son; what advice would you give other parents? Sam is my 2nd chance to be a parent I have 3 biological children that were taken from me because I’m transgender. I love him and my soon to be wife and wouldn’t change that for anything in the world….